After WW II aircraft #729 was converted to a refueling role, and served in the Korean War before being sent to rest at the China Lake Naval Gunnery Range in California. This is where we found her in 1986. The Lowry Heritage Museum along with local veterans of B-29 service wanted a B-29 display, and knew that China Lake held the last major collection of airframes. We arranged to transfer an aircraft to the official Lowry AFB Heritage Museum, collected money and volunteers, found a "suitable" airframe, and trucked her to Lowry in bits and pieces. The museum contracted with Mel Blanscette from Ogden, Utah, to supervise the shipment and rebuilding of #729. With B-29 engineering knowledge as well as extensive battle damage repair experience, he was the man for the job. The rest of the crew was filled out with volunteers, mostly WWII vets who flew or maintained B-29s in The War. Before long we were a tight-knit bunch who took on the name of "Mel's Misfits!" Not many B-29 aircraft have survived over the years. Cannibalized, sold for scrap, shot at for practice (After all, China Lake is a gunnery range! ), these were some of the survivors. 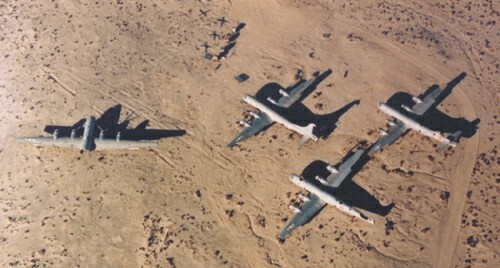 #729 is in the center of the above photo, the only one with a vertical tail. Above is #729 from the ground, showing her rather poor condition.